Developing Android applications not only require the knowledge of Java/XML etc. but also required the skills to design different types of icons for your Android apps. Most of the developers use tools such as Photoshop, CorelDraw etc., but if you do not have the designing skills, or you want to generate your Android App icons quickly. 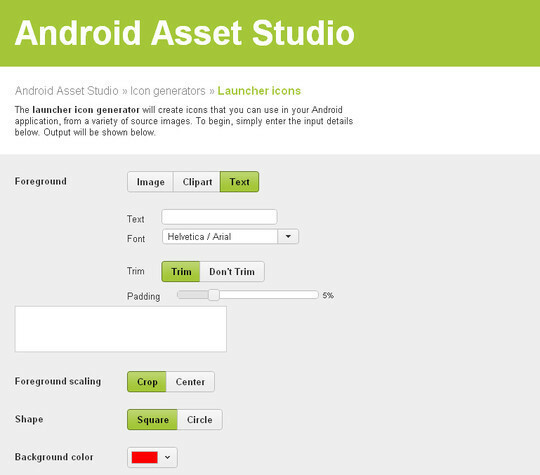 You can use a Free online tool "Android Asset Studio". Android Asset Studio Icon generators allow you to quickly and easily generate icons from existing source images, clipart, or text. Currently, you can create following types of icons using Asset Studio.